I’ve arrived in Lima, and am preparing to go out to a parish next week. I’ll be here for two months, and return to Boston on May 1. I’m very sad to be leaving Ecuador now, but I’m also looking forward to these two months. As I was saying to the taxi driver when arriving, bringing good news is really about making space for encounter with Jesus in a mysterious but very human way - a space where the good already inside of each of us, as individuals and community, can blossom and come to fruition. It operates on attraction to an example, so the Christian or missionary has to be already “bloomed” themselves! The good news is that that freed life now present in front of them, is now with them, and is for them to live too! Please pray for me in my “blooming” - and for all our continued blooming in Christ! 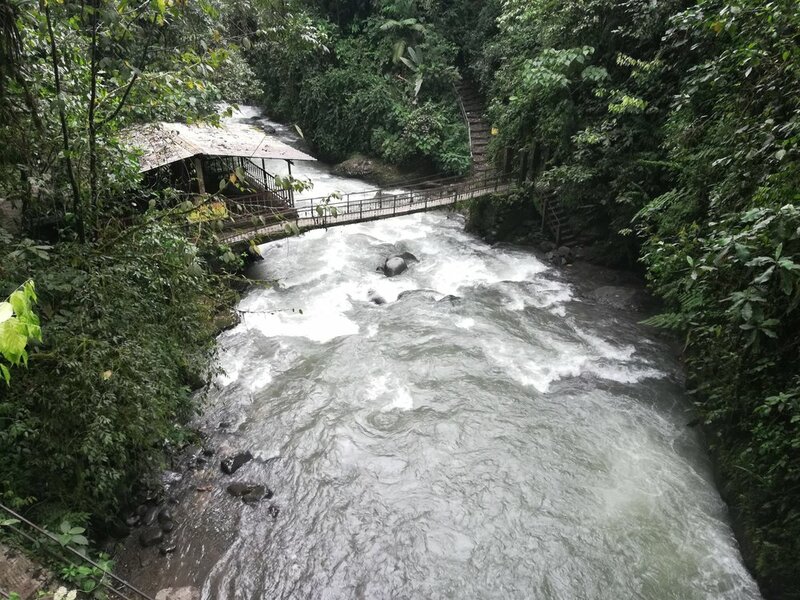 I spent about a week in Mindo, regathering from the last several months. It’s a chance to have some personal space and do things I haven’t had the opportunity to do in a while, including writing updates and reflections, as well as catching up on communications and planning for next steps in going to Peru. 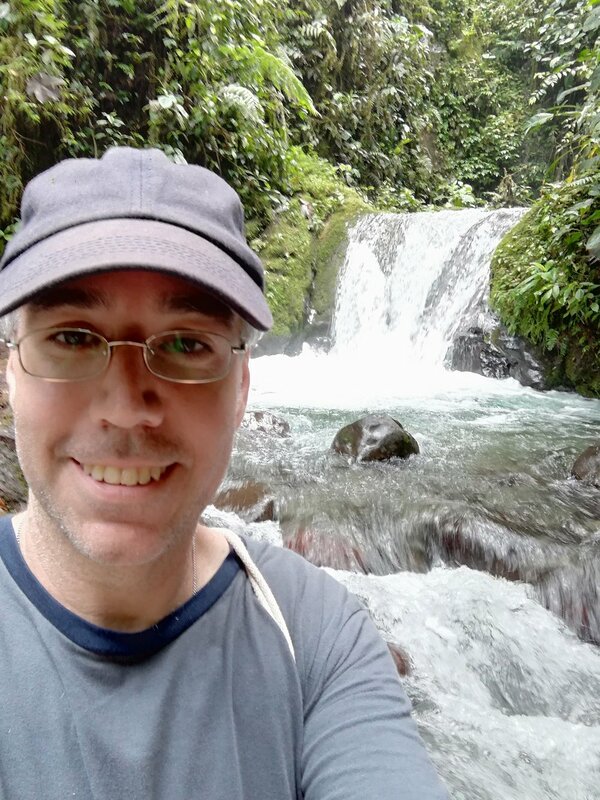 At the end of my time sort of hunkered down in Mindo, I took some advantage of entering into its natural beauty. There is a waterfall sanctuary there that I had visited some years ago, and I returned again. 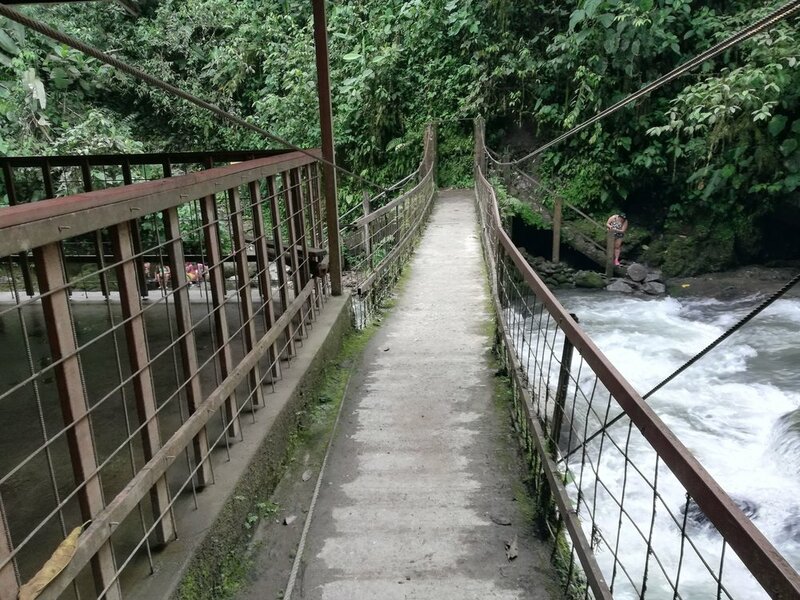 It takes about 4 hours in total to go to it, cross over the valley in a cable car, enter down into the sanctuary and follow the paths to the waterfalls, and then come up and do everything in reverse to get back to the center of Mindo. On the day I flew out of Ecuador, I traveled by bus for 2.5 hours from Mindo to Quito, from there took a 20-minute taxi to another bus near the center of Quito. That bus goes all the way to the airport for just $8, in about an hour. So, I had a chance in the airport to eat a dinner I brought from Mindo. 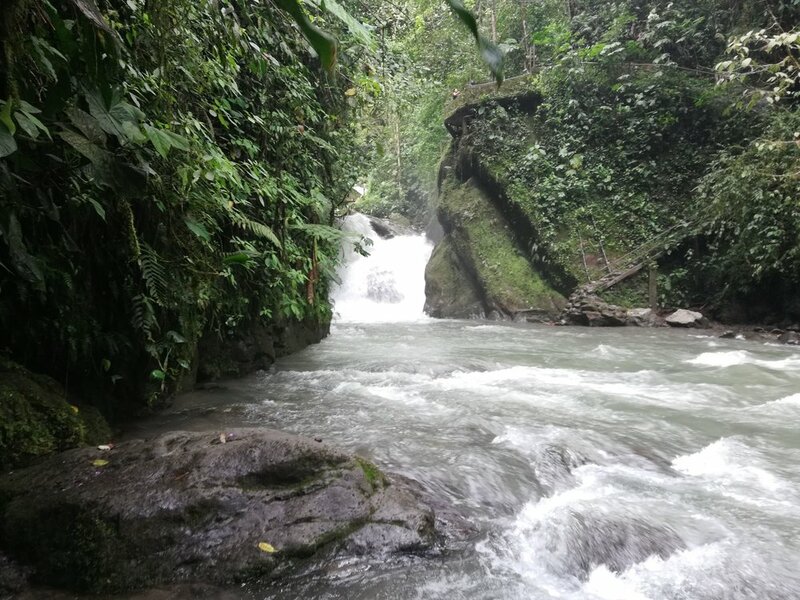 I had locally made peanut butter, locally baked whole-grain bread, locally grown baby bananas (oritos), and Guitig, natural effervescent spring water from Ecuador. The cost of the meal was probably about $1.25. Beats airport food prices and a lot healthier! … I had a few oritos left over that I brought onto the plane with me, thinking I’d eat them when I got to Lima. 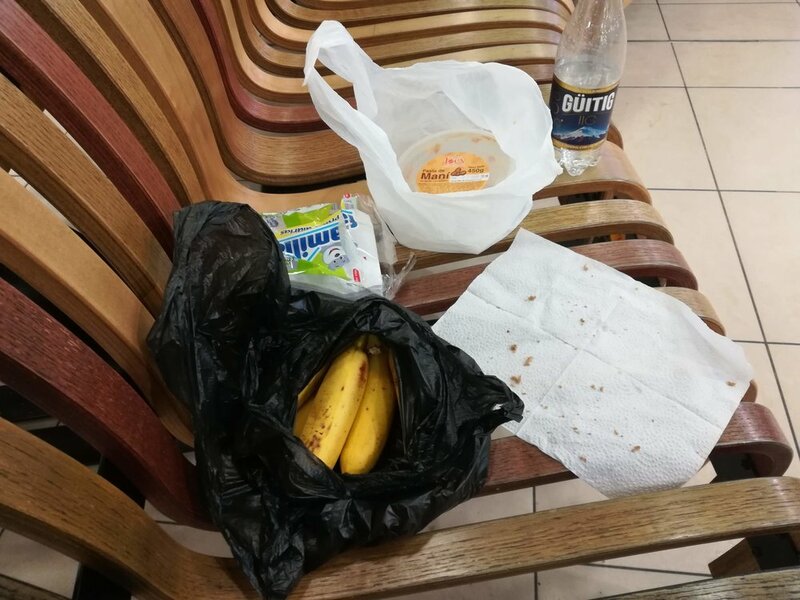 But in the baggage claim at the Lima airport, while I was looking around for the conveyor belt, I heard a voice say, “Sir, are you carrying any fruits in the bag?” I turned around to an armed guard and a very happy sniffing dog. The dog had sniffed me out! Apparently, you can’t bring fruits in, so the guard took my last two oritos, though thankfully he didn’t take any other action. But I was impressed that the dog caught it - and glad to know that they can do that for the sake of safe travel! Well, I hope we all have the same success sniffing out the fruits in our lives as the dog! Lent seems like a good time for stopping for a bit and developing our spiritual sniffing sense.